There’s more to being a better athlete than just strength or just speed. Being a Complete Athlete means that you can sprint fast and efficient, change directions with quickness and great footwork and jump and accelerate with power. As much as anything it means you have the strength & mobility to support and sustain all of this with less risk of injury. This all starts on day 1 with a comprehensive athletic assessment. This is typically 1-on-1 with a coach. Pending the health of the athlete, we start with a performance evaluation. 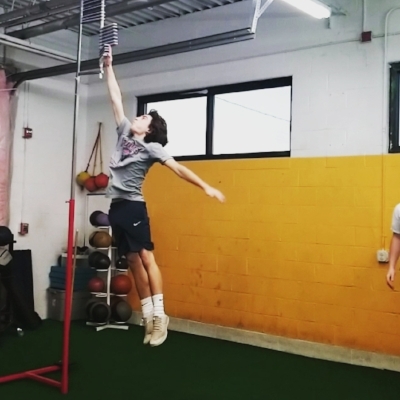 This includes testing for vertical power (vertical leap test), as well as sprint speed (20 yard dash) & agility (5-10-5 agility test) both timed with digital precision. We also administer a thorough movement evaluation. Our goal is to find out what your body does when you’re being an athlete. Among other things we evaluate jump & squat technique. We also look at running form & trunk strength. The information gathered in this process is coupled with each athlete’s goals to develop the most effective individualized plan to improve. Our coaches want to make sure that each athlete has clear directives and expectations by the time they come to their first full workout. 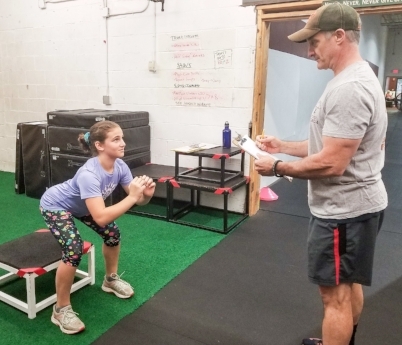 Whether our coaches are re-testing our athlete’s performance testing stats or evaluating the progress of an injured athlete’s recovery we want to know that the training is working for each individual. We have an extensive collection of performance testing stats to compare individual progress vs. the average. We also have physical therapists on site who we can lean on for advice if needed in progressing an injured or recovering athlete. If/when necessary our coaches adjust the training protocols of individual athletes. We’re always looking for the correct point in time to progress each athlete individually.